A Roman wall and two burial grounds are among the latest archaeological treasures unearthed in the southern city of Sidon, which every now and then reveals another glimpse of its rich and ancient history. The burial grounds and the wall – more than 12 meters long and up to 2.5 meters high – were found at a construction site in the Sidon neighborhood of Bustan al-Kabir. Skeletons, pottery and coins with Latin inscriptions were also discovered inside the burial grounds. The office of the Directorate General of Antiquities in Sidon mobilized a team of experts and workers to continue the excavations. 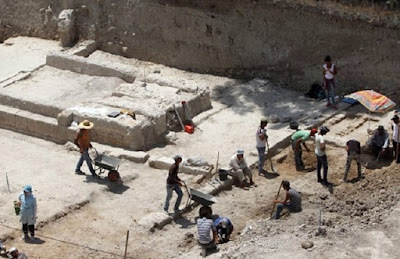 According to archaeologists who specialize in the history of the city, discoveries such as the ones made in Bustan al-Kabir help to complete the map of the Roman Sidon, as every small excavation aids in their understanding of the city during the Roman period. Speaking to The Daily Star on condition of anonymity, specialists said the presence of burial sites in Bustan al-Kabir indicates that the area was located away from contemporary population centers, which were closer to the sea. Their position on the coast helped foster business, trade and communication with the outside world. The discovery could also provide more information on Roman burial rituals. Similar Roman burial grounds, with skeletons, pottery and metals, were uncovered in the same neighborhood around seven years ago. More ruins were discovered in another district of Sidon Wednesday, as an ancient Roman column was lifted from a public work site in the city. The uncovering of antiquities is a regular occurrence in the city, believed to be around 6,000 years old. The discoveries help explain the lifestyles, rituals and physical surroundings of the peoples and civilizations that once lived in the city. In November of last year, Sidon began constructing a museum to preserve and showcase its precious ruins. The museum will be established beside the old city’s Freres archaeological site, to provide visitors easy access to the ruins. The space is being designed to accentuate the site’s natural attributes, with pathways connecting to old and modern Sidon. The museum will span 1,600 square meters and bring together all of the city’s ruins and artifacts. Many items unearthed in Sidon are currently housed in other locations, including the National Museum of Beirut and the storage houses of the Directorate General of Antiquities.